Duff Bevill, former Board Member. 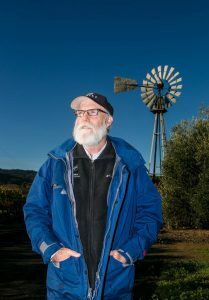 Duff Bevill has been involved in the Sonoma County grape growing scene since 1973, when he moved to the county and went to work for Joe Vogensen in Dry Creek Valley in March of that year. Bevill explains this time as “the first big post-prohibition wine grape boom,” before the economy took a downturn a few years later and the price of grapes dropped. After his roughly three-year stint with Vogensen, Bevill moved on to work for Clarence Wolcott for about a year, before joining the team at Dry Creek Vineyard under Owner Dave Stare in 1978. It was at Dry Creek Vineyard that Bevill was asked to oversee the farming operations at the estate, while simultaneously being allowed to farm other vineyards as well. His vineyard management work at Dry Creek Vineyard and his freelance farm work with other vineyards led Bevill to create his own LLC in the mid-1990s. “I started with basically nothing. I hired my first employee and bought my first tractor, and it went from there,” Bevill says when asked about his humble beginnings. Today, Bevill Vineyard Management owns their own vineyards, sells grapes to roughly 45 wineries in Sonoma County and manages the vineyards of 30 individual clients. Bevill’s longstanding roots in the Sonoma County grape growing community naturally make him a leading member of the Sonoma County Winegrowers. Prior to the organization becoming a commission, and Bevill played a strong role in guiding the organization into becoming a commission. 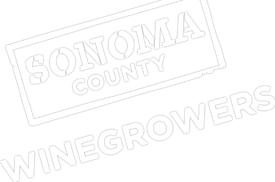 “It became clear to many of us on the board that we should pursue trying to create a state authorized winegrape commission. It had been attempted back in 1991, but the vote failed. So, we cycled back to it again,” Bevill says. “I gave a speech at Dollars & $ense that year about becoming a commission and it passed with like 85%—so we must have done a good job at marketing the value of a commission,” he furthers. Bevill was the inaugural Chairman of the commission and served for two years. Sonoma County Winegrowers would like to thank Duff Bevill for his commitment and hard work with the organization over the last several decades, and we are pleased that Bevill will be continuing his work with the commission on the Executive Committee.